April Member of the Month - Meet Tini Judi! Spring Flings, Bling, and Fun Mini Things! Sooner or later, we all wonder what to do with those really cool acrylic boxes that some minis come in. We know that they have too much potential to just throw them out, so most of us have a stash of these boxes tucked away somewhere. 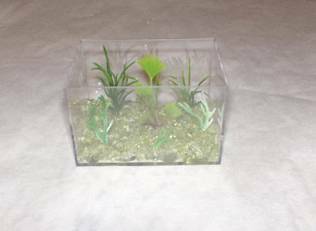 Here’s a neat little mini you can make from one of those boxes! 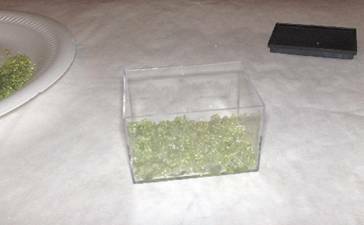 Begin by laying a puddle of hot glue in the bottom of the plastic box and sprinkle the stone chips onto the glue. Wait for a few seconds for the glue to slightly cool and use a blunt instrument to tamp the stones down into the glue. Cover the bottom and slightly up the sides to create the gravel in the bottom of the aquarium. Glue in the plant clippings. 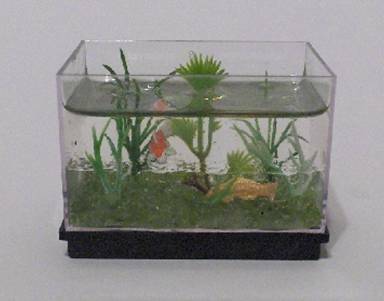 Fill the aquarium with the acrylic water. 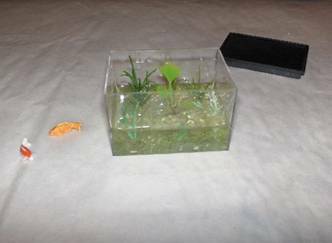 To get the fish to stay in place in the water, I used invisible thread tied around the fish and secured to a toothpick suspended across the top of the aquarium. When the water had hardened, I simply cut the invisible thread off at the water line. 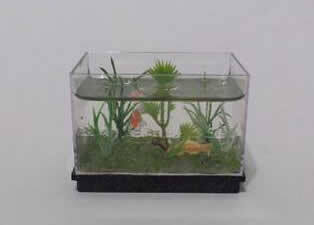 Place the aquarium on the lid for a base and that’s it!